Why: There’s no question Trevor Siemian remains the Vikings backup quarterback, according to head coach Mike Zimmer. But Kyle Sloter’s impressive night against the Seahawks, and my previous overlooking the Vikings had controlled at least three quarterbacks each of the last two years (the third QB on PUP each time), has led to this change in one man’s projection. Sloter, who had an up-and-down camp, remains entrenched as the No. 3 quarterback with promise. Why: Boone heads into Thursday’s exhibition finale in Tenenssee with a leg up on the No. 3 running back job over Mack Brown and Roc Thomas — both sidelined by injuries since the Aug. 11 preseason opener. Thomas was back in full-team drills during Sunday’s practice and should be on the field in Nashville to push Boone for the roster spot. Why: Beebe has downright impressed in both practices and preseason games, but that doesn’t mean he’s a lock. The murky bottom of the receiver depth chart could still feature Coley, the second-year promising talent. The Vikings think highly of Coley. The problem is he hasn’t been able to stay healthy. However, if the Vikings need an extra roster spot for an offensive lineman, they could waive a receiver to make room. Why: There are few skill-position reserves whom the Vikings have gotten longer looks at than Conklin, the rookie with 38 special teams reps in three preseason games. His hands have stood out in practices, and he’s the expected No. 3 tight end. Why: The lingering question remains when will Pat Elflein be ready to practice, let alone play? Elflein isn’t expected to practice this week, according to Zimmer, making for a prolonged absence that continues as the Sept. 9 opener nears. If Elflein isn’t cleared by the medical staff before the end of the preseason, he’ll be out at least six weeks on the regular season PUP list (where he won’t count against the 53-man roster). The trade for center/guard Brett Jones on Sunday indicates the Vikings don’t expect Elflein to be ready for the regular season opener, at least. Why: The Vikings boast a lot of intriguing youngsters in the defensive line room, and it’s difficult to project Odenigbo getting waived. But the projection here stays the same with Weatherly and Bower poised to take over when Robison retires next spring. Odenigbo is a bit of a tweener after gaining weight to play defensive tackle, where the Vikings have since moved him back out to end after he starred there against the Jaguars. Why: Will Williams take the final roster spot? 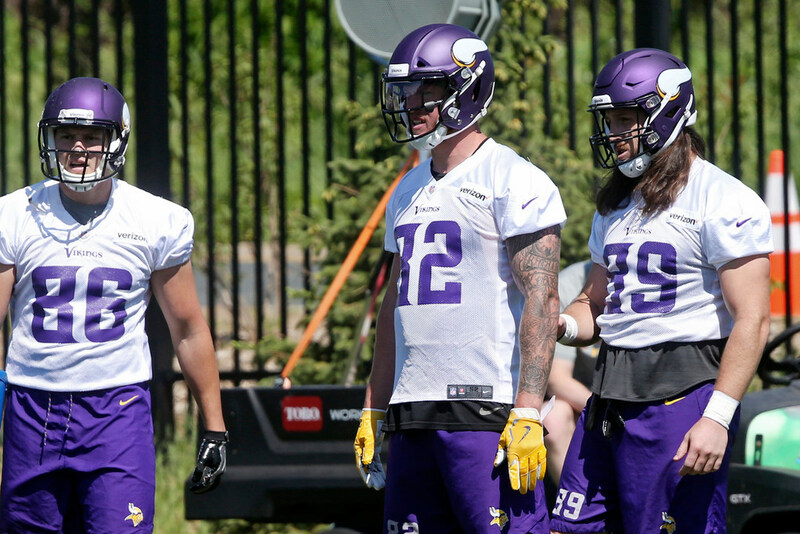 Or can the Vikings settle with five linebackers until Brothers returns Week 5? Downs and Dooley have also received a lot of run on special teams during the preseason, meaning one of those two could make a case if they stand out in the third phases. Why: The Vikings find a way to keep 11 defensive backs, just like they did last year, with the August addition of Iloka to the group. Here, I’ve got them taking away one linebacker spot (with Brothers not counting due to a four-game suspension) to make room for five safeties. Why: Forbath was cut after missing a 41-yard field goal against Jacksonville, then Carlson misses two 42-yard kicks against the Seahawks. The Vikings drafted Carlson to finally find stability at kicker, and the rookie had a rocky start as the new guy.